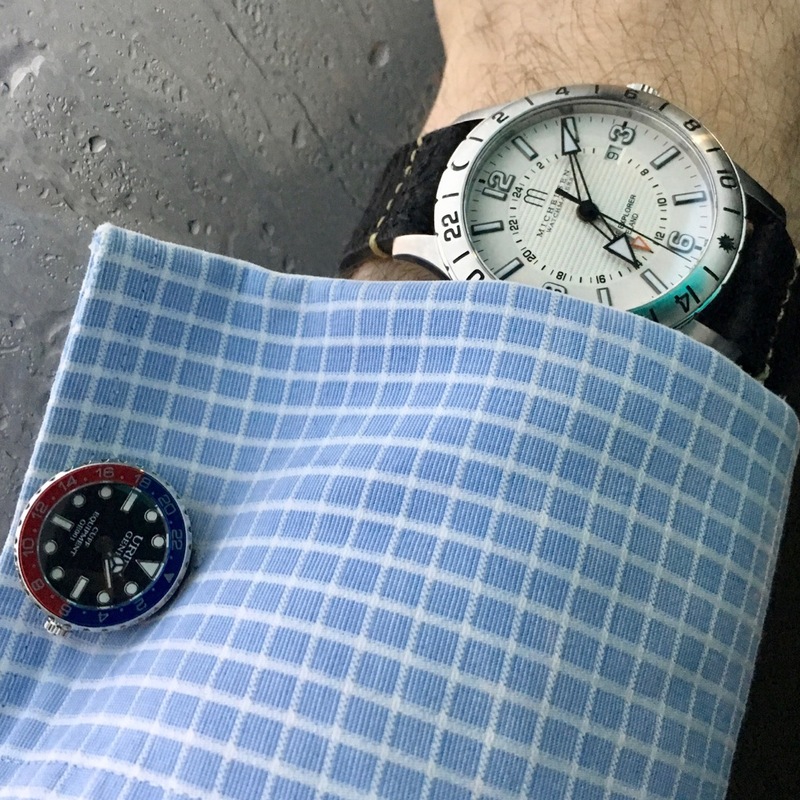 It was a bit over a year ago that we first told you about the Uriel Geneqt cufflinks, cufflinks that looked very much like small Rolex GMT Master watches to put onto your cuffs. Well, we bided our time patiently, and were recently able to get a pair of the Uriel Geneqt cufflinks in, in classic red-and-blue “Pepsi” guise. Now, on one hand, cufflinks are cufflinks, and they all perform the same basic duty – holding the cuffs of a French cuff shirt closed. As with any accessory, though, you’ve got all manner of choices. For us watch folks, you’ve got some links that look like casting of famous watch models, or perhaps older (smaller) movements that were salvaged and built into a cufflink. When it came to something that was actually functional and, dare I say, useful, you had much less choice. Enter the Uriel Geneqt cufflinks. Simply put, you’ve got two small quartz-driven watches, each keeping time independently. This lends itself to the GMT Master ethos by setting one link to your home time, and the other to your local time. AKA, just like you would do on a regular GMT watch. Here, the back end of the link (that you flip over after passing it through the button holes) have things labelled, so you can keep your home and local time zones straight. Once in place on your shirt, they do their job quietly and succinctly. The bezels on the Uriel Geneqt cufflinks are fixed, but they are recognizable – even by non-watch folk – as being based on a famous watch design. For my part, it allowed me to say, quite simply, that I was wearing three watches at the time (and tracking from 4-5 time zones, if I were so inclined). Of course, that might be a bit of overkill. Where something like the Uriel Geneqt cufflinks shines, I think, is if you have a shirt that has tighter cuffs and slipping a watch under them is a difficult situation. Or perhaps you don’t want to wear a watch at all. Whatever the reason, you could easily head out for a night without a watch on your wrist, and instead rely on the Uriel Geneqt cufflinks to keep you on time – day or night (yup, they’re lumed). Would I wear it? Sure would – and have been! The best thing about it: How else can you get all gussied up, not wear a watch, and check the time without pulling your phone out? GMT FUNCTION: “HOME” AND “AWAY” ON THE BACK OF CLOSURE….THE “HOME” ONE WILL SHOW THE HOME TIME, AT THE SAME TIME, “AWAY” ONE WILL SHOW THE LOCAL TIME. Next articleSurf’s up with the Nixon Base Tide Pro… in Colorado?